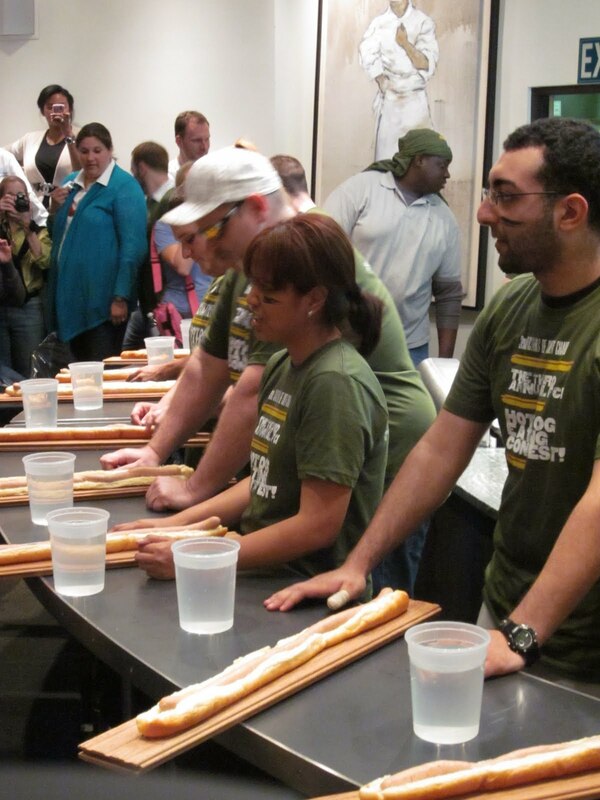 On Thursday, June 10th, the French Culinary Institute hosted their third annual Hot Dog Eating Contest. The original level 1 culinary student from my class that was selected to compete was unable to do so and somehow I ended up replacing him. I'm not one to back down from a challenge, but I had a feeling I might be in a bit over my head on this one. The rules of the game were that the challengers were to consume a 30-inch hot dog, and matching bun, in the shortest amount of time possible in order to win fortune, glory, and gift certificates. 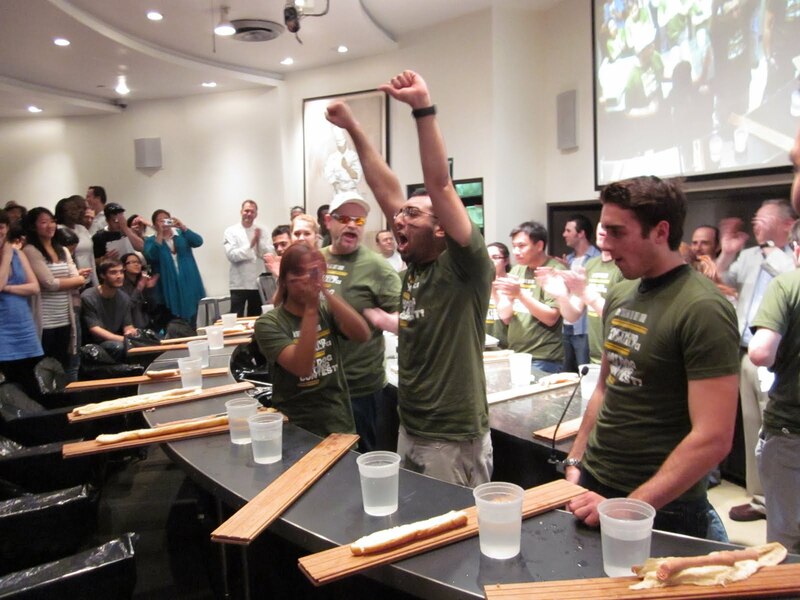 Aside from competing with my older brother for who could eat the most mashed potatoes at the family dinner table, I had never been involved with an eating competition, let alone having the hopes and dreams of my class resting on my shoulders. After reluctantly agreeing to compete, I spent a good part of the rest of the day thinking about the competition and trying to formulate the strategy that would take me to the top. I knew that any speed eating methods that I came up with would have to be tested prior to the big day; I needed to train. After class, I changed my clothes and headed down to Full Circle Bar in Williamsburg, a Skee-Ball bar that only serves one food item: hot dogs. According to The FCI article about the event last year, the winning participant finished the dog in less than three minutes. With that benchmark in mind, I stepped up to the bar and ordered a glass of water and five hot dogs (roughly totaling 30 inches). With various techniques roughly planned out and the opening notes of Paul Engemann's "Push It to the Limit" going through my head, I signaled my timekeeper that I was ready to go. The next few minutes were a flurry of meat, bread, and water as I stuffed the dogs into my face as quickly as possible, eating each one differently to try and find the fastest way. I found that tearing the hot dog in half and dunking it, bun and all, in water and then chewing was the fastest way. I finished them all in what I thought was a very respectable time of 2 minutes and 47 seconds. I figured that I could take off at least 15 to 20 seconds when it came down to the competition because I wouldn't need to experiment with strategy. The day of the competition was probably the worst possible lesson day to have before an eating competition: Potato Day. I love potatoes and tried to convince myself that the upcoming event was more about speed than volume, so as long as I just had small portions of the dishes we were working on I'd be just fine. I was unprepared for how delicious the potatoes would be and even with my classmates keeping a watchful eye on me and slapping my hands when I reached for another golden fried potato chip, I still managed to sneak more than I should have. I constantly reassured my classmates by saying "I've got this!" whenever somebody mentioned the contest. Everyone had come together and chipped in enough money for the entry fee ($50), all of which goes to an emergency grant fund for FCI students in immediate financial need. The day went by quickly, and with my stomach a bit more full of potatoes than I would have liked, it was time to go down to the culinary theater to win this thing. When I arrived at the theater, the room had already begun filling up with students and staff. I eventually found a few of the other competitors, and we made our way to the front where the first two rows of chairs had been covered by plastic garbage bags—a sure sign we were in the right place. Before the student contest started, the staff had their own competition: who could eat the most mini–hot dogs in 3 minutes. Dave Arnold (director of technology), in a blue luchador mask and matching cape, won by eating around 12 1/2 hot dogs. Between the potatoes still in my stomach and watching the staff event, I wasn't looking forward to my own challenge. Fortunately there were additional delays as the winners of the condiment, beverage, and fund-raising competitions were named. By the time everyone stepped up for the main event a bit of room had cleared up in my stomach and I regained my confidence. It was go time! Students get ready to compete. The theater was packed, and the crowd was hungry for blood. 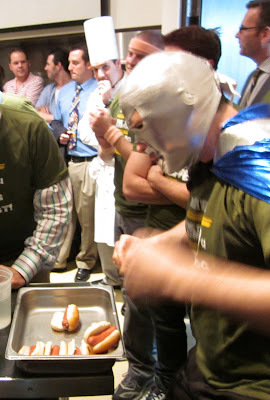 Pods of students were cheering for the favorite hot dog gladiator as we all found our way to our eating stations, garnished with quart containers filled with water. I took my place in the back row and meditated briefly on my strategy. The hot dogs were delivered to us on long planks that hung over the counters they were placed on, I started to sweat and wonder why I was willingly doing this to myself. But before I knew it, the starting pistol belched fire, and I was grabbing fistfuls of hot dog, dunking them in water, and shoving them into my mouth. On my third or fourth tear of the dog, I choked on some of the water, sending bits of meat up my nose. It was incredibly uncomfortable, but the roar of the crowd inspired me to press on. When I was halfway through, I took a look around at my competition. To my surprise, everyone I could see had consumed roughly as much as me. It was still anybody's game, and I tried to chew even faster. I had about 8 inches left to eat and was still confident that I had a chance to win, when I heard a swell of cheering: Somebody had finished. I decided to press on as there was still a chance to come in second or third. 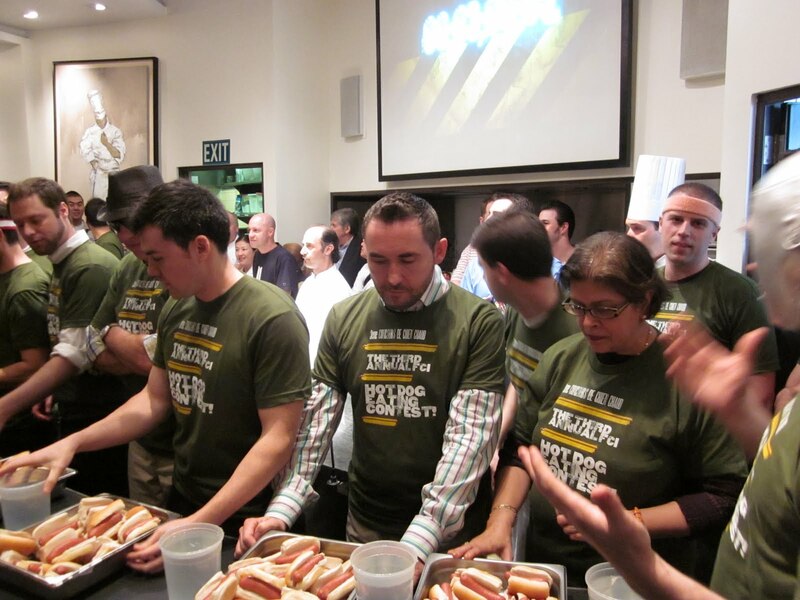 A few more seconds passed, and two other competitors finished there dogs. I had lost, miserably. 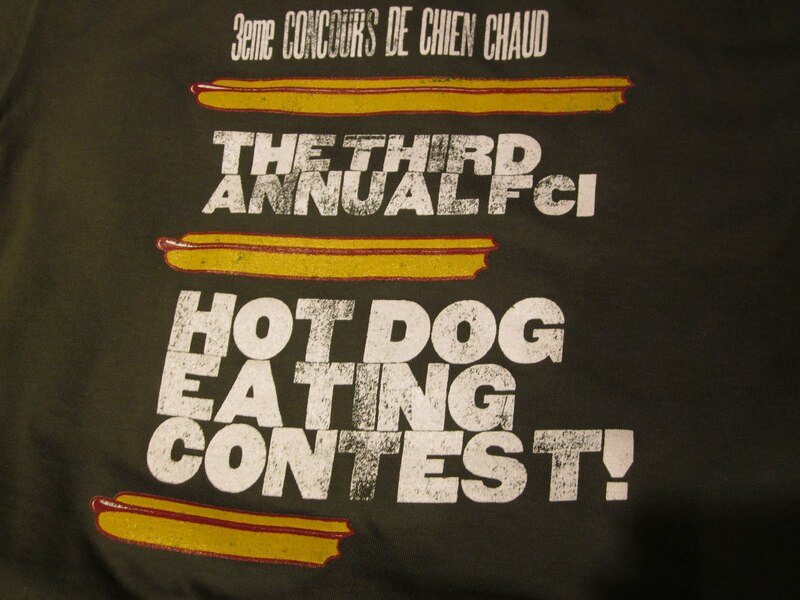 The contestant that won had finished their hot dog in less than two minutes. I never stood a chance. My hot dog remained unfinished, laying half on the plank and half in a puddle of splashed water and soggy bun bits. Although, I am disappointed that I didn't win, it's nice not be known as the guy that can eat faster than anybody else. It was a fantastic experience, and somehow I'll find a way to make up my poor performance to my classmates. An FCI Dairy Challenge maybe….